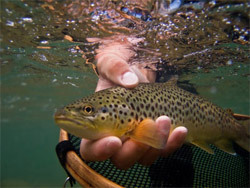 Clear water, heavy pressure, stocked fish — they’re circumstances that challenge almost every avid trout angler eventually. Wild fish junkies we may be, but you don’t have to be a hatchery-truck chaser to find yourself casting to fish that don’t respond to “classic” presentations. In this week’s “Fine Lines” column, Phil Monahan answers a reader who wonders whether there aren’t certain flies and tactics that work better with stocked fish.